Masaya Chiba utilizes painting, sculpture, and installation to create dreamlike works that respond to Surrealism traditions while also exploring the limits of representation and translation. 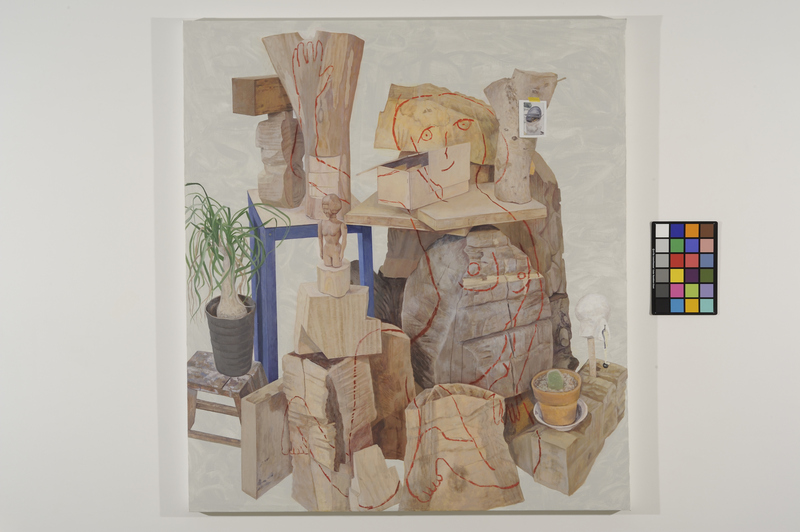 Many of his paintings begin as assemblages in his studio, and in preparing these installations, Chiba collects seemingly random assortments of objects – photographs, wooden planks, potted plants, excess paint – to stage unusual material landscapes. Other objects used in his paintings are also drawn from memory, suggesting an illusory attempt to recapture objects and experiences that no longer exist in the present. Once configured into a desired form, Chiba utilizes these installations and objects as studies for his richly rendered oil paintings. Seemingly whimsical at first glance, his pictures also suggest an undercurrent of anxiety and instability, as if the perceptible world was melting away below us.